Obama’s Immigration Plan Has Been Put On Hold — Does That Mean We Can Avoid a Shutdown? On Monday evening, a federal judge in Texas issued a temporary injunction blocking the policies pushed by President Obama’s executive action on immigration — some of which were scheduled to begin on Wednesday. 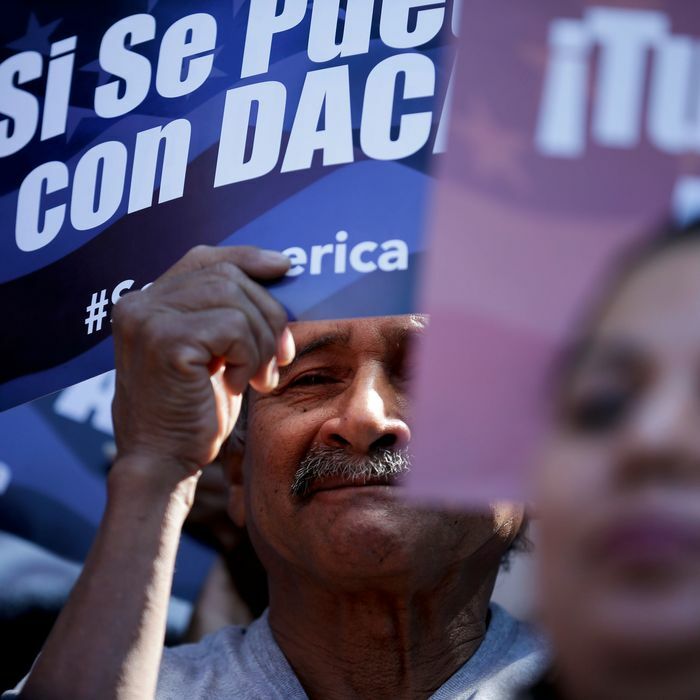 The Obama administration responded to the decision the following day by putting the immigration plan on indefinite hold, although they plan to appeal. The week’s events would appear to have made congressional Republicans’ plan to stop Obama’s executive action by all means necessary — i.e., shutting down the Department of Homeland Security next week by not passing its budget — seem a bit … unnecessary. Shutting down the government to express frustration with a policy that is already on hold is not a story to save for the grandkids. But don’t call off your shutdown vigil just yet. Many conservatives are interpreting this week’s developments as a validation of their original strategy, and seem just as interested in taking a stand against Obama as on Sunday, when Speaker of the House John Boehner said he was “certainly” prepared for a shutdown (despite the fact that polling shows that Americans would blame Republicans for the shutdown). Democrats — even moderate Democrats unsure about the executive action — announced that the decision has not changed their battle plan, either. They do not intend on acceding to any budget that seeks to block the White House’s immigration plan, including the one recently passed by the House and filibustered by the Senate. Meanwhile, the White House is determined to veto any budget that de-funds Obama’s executive action. Preparing for the worst, both parties have begun releasing a flood of statements blaming the other side for a hypothetical shutdown, or arguing that a lapse in funding for one department wouldn’t even qualify as a shutdown. Political groups are likely preparing apocalyptic subject lines for potential shutdown-themed fund-raising emails as well. The best chance for avoiding a shutdown involves Republican leaders deciding that keeping the government open is a better outcome than ruining Obama’s day — and then teaming up with Democrats to overcome conservative Republican opposition. One last-minute compromise might leave Congress extending DHS funding in the short term with a continuing resolution. This would leave Republicans with another opportunity to challenge Obama’s executive action in a few months, perhaps after a higher court has decided whether the program can resume. DHS is dreading another continuing resolution — like the one passed last December designed to cause next week’s showdown — as it restricts the agency’s ability to make long-term plans. The next stop for the court case — a lawsuit filed by 26 states opposing the executive action — is the 5th Circuit Court of Appeals. The Justice Department is considering whether to ask the appeals court to stay the lower court’s decision. That would allow the Obama administration to begin accepting applications from undocumented immigrants while the case is in the works. It could take months for a final resolution, especially if endless appeals send the lawsuit all the way to the Supreme Court, where Obama’s other significant policy, the Affordable Care Act, waits for judgment. In other words, the only thing we definitively know about next week is that those hoping for (or against) immigration reform should prepare for more anxiety-riddled waiting — which happens to have been the status quo for years now. Is Congress Still Heading for a Shutdown?